the Impluvium tank developed by iDE is low cost water tank (1200$ for 23 m3) that harvests rainwater from its own and closest roof. Climate change issues and the economic situation of developing countries demand new strategies that increase climate change resilience; food and water security; and that support the incomes of communities, particularly smallholder farmers. 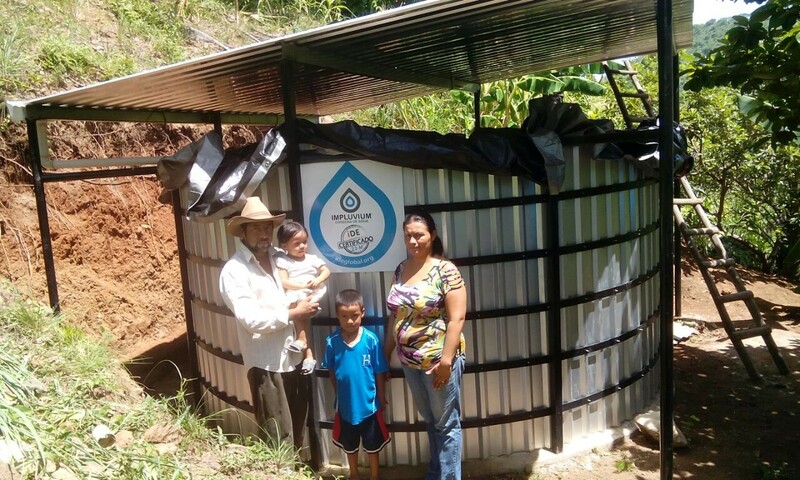 This case study* presents “Impluvium” tanks, an innovative and cost-efficient roof catchment rainwater harvesting system that iDE is implementing in Honduras, Central America. The overall goal of this case study is to contribute to the replication and scaling up of this specific type of technology for off-season small-scale irrigation in arid and semi-arid areas. For storing rainwater, iDE has developed and built many “Impluviums” since 2014. The first Impluvium was developed at iDE's tech center funded by Swiss Agency for Development and Cooperation (SDC), with additional support from RAIN Foundation. These are a new kind of low-cost water tank (1200$ for 23m3) that harvest rainwater from their own and nearby roofs. These tanks can also be filled from rainwater harvesting ponds using solar pumps such as the Sunlight pump designed by Ennos gmbh, a Switzerland-based startup. This eliminates requirements for recurring electricity and fuel costs while reducing gas emissions. *The associated technical sheet is available to download form the right-hand column, and has been developed in cooperation with iDE-Honduras (https://www.ideglobal.org/country/honduras) and Ennos AG (www.ennos.ch). International Development Enterprises (iDE), has been developing a water storage solution that is cheaper than a fiber cement tank, without having the disadvantages of fiber cement (fissures) or a water pond (mosquito proliferation and necessity to lift water before use). In Honduras, iDE found an innovative way of building a “closed”, 2m height water tank, for driving water by gravity to crops. Built with locally available materials, the Impluvium comes with a roof and gutter system and is suitable for both production and drinking water needs. The Impluvium can also be used in combination with a water treatment solution to purify the water before human consumption. For irrigation, the Impluvium can be used in combination with a drip kit in order to make the most efficient and productive use of the water. A large rainwater harvesting tank is even more useful if you can fill it continually after the rainy season. This can be achieved through a pumping system that can fill the tank from another water source. Using a solar-powered pump avoids high running costs and carbon emissions. In Honduras iDE are using the sunlight pump produced by the Swiss social enterprise, Ennos AG, which is designed for smallholder irrigation and drinking water supply in developing countries. It is suitable for a broad range of applications and can be used for irrigation, allowing those who rely on rainfall to cultivate their few acres of land, to reduce the risk of crop failure and increase their productivity and income. Expense: The Impluvium costs 1200$ and the sunlight pump between 1100$ and 1400$ (including installation service), depending on the size of the solar panel required. Financing the systems: In order to reduce the barrier of a high upfront investment, the technology may be developed in combination with are micro-credit institutions and smart-subsidy programmes. Acceptance and scaling-up potential of the new technology: The Impluvium was introduced in Honduras four years ago. The technology has been continuously improved and different options have been tried to find the best design for the needs of the user. Today, there are more than 20 units operating in the field. People are very interested in those technologies and iDE is ready to scale-up. In addition, the sunlight pump has been extensively field-tested in several developing countries. Based on the feedback received from the users, the sunlight pump was designed to serve the needs of smallholder farmers and communities in terms of its capacity and functionality. The first demos of the sunlight pump in Africa and Central America have generated a lot of interest. The combination of the Impluvium tank and sunlight pump permits the cultivation of 1 to 3 hectares under drip irrigation, all year round with close to zero operation and maintenance costs. Such an innovative irrigation system allows the users to improve their income, to increase food security and to adapt to climate change. Moreover, with the introduction of these technologies, new technical capacity, know-how and local jobs are created. In regard of cost reduction per m3, it is better to make the tank as big as possible, as it will require fewer materials to pass from 10 to 20 m3 than from 0 to 10 m3. Another advantage of a large tank is the capacity to store large quantities of water over a long period of time when the tank cannot be refilled - for example during dry season. Using a sunlight pump with a 300 Watt panel over a standard diesel-fuelled pump saves around 135 litres of diesel and around 380 kg of CO2 emissions per year. The excess energy from the solar panel that is not used for pumping can be stored in a battery and used for other purposes (light, phone charging, cooling etc.). By combining a solar pump, which depends on daylight energy, with a large tank like the Impluvium allows farmers to irrigate during those hours of the day when evaporation is reduced. If the farmer also wants to breed fish in the Impluvium, the pump can also be used to oxygenate the water. In order to guarantee productive use of the sunlight pump over many years, the installation has to be done by a trained expert: iDE offers an installation service to ensure this. This increases the lifetime of the pump, guarantees that the pump is used at its full capacity and that the users are also well instructed in its use. The Impluvium has to be built by a certified artisan to ensure the quality of the structure. The quality of bags used for the impermeability of the Impluvium has to be strictly controlled. The water source needs to be sufficiently reliable and of good quality to fill the Impluvium all year round through solar pumping or gravity, without the need to use the community water network, as that could create tensions. Farmers need to have sufficient lands and willingness to expand their activities to take full advantage of both technologies as they provide a considerable amount of water every day.